Posted on April 2, 2013 by Cori and Skotte Tagged iHanna postcard swap 2013	Comments4 Comments on Postcard Swapping! I signed up to participate in iHanna’s 2013 DIY Postcard Swap. So much inspiration comes to me from iHanna’s blog and art. I have never participated in a swap before, even though I’ve wanted to for years and years. I just jumped in with both feet! I will be posting the cards that I made in the next few days. I received my first postcard a few days ago. 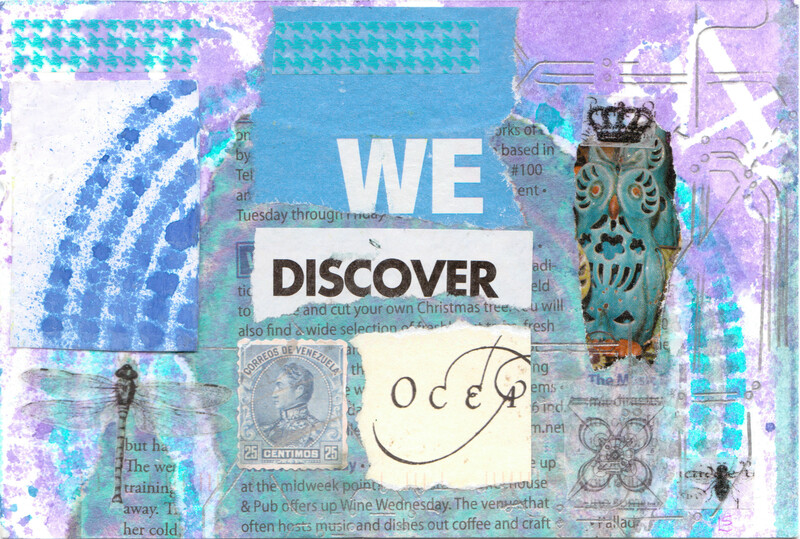 It is titled “We Discover” and is made by LS Lee. I am delighted with this postcard. I love the different textures and papers. I collect stamps, so I love the stamp inclusion. I also used a couple of dragonflies in my postcards, so I think it is neat that LS Lee did, too! I love colors – these are so peaceful, flowing, and calming. I am also fascinated with the embossed silver design on the right side. Thank you so much, LS Lee for the wonderful art! Thank you iHanna for hosting a fantastic postcard swap! I can’t wait for my other postcards to arrive! This entry was tagged iHanna postcard swap 2013. Bookmark the permalink. Oh, thank YOU! And how cool that you’ve already received the first one. Very pretty! It surprised me, too! Now I can’t wait to get the mail each day. Thank you for hosting this, and making the creative process so easy and inspirational.